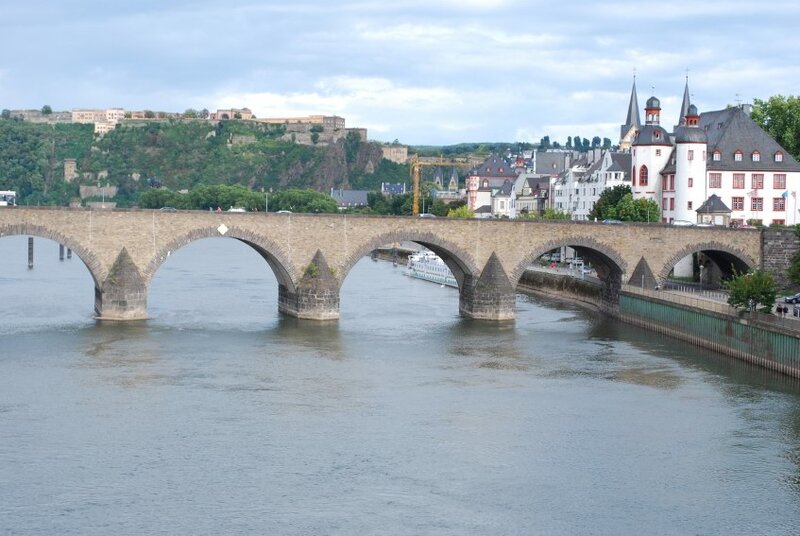 Set where the Moselle River meets the Rhine, some 79 mi/127 km northwest of Frankfurt, Koblenz, Germany, offers an impressive waterfront and a number of graceful 17th- and 18th-century buildings. The small Mittelrhein Museum displays some of the Romanticism-era paintings that helped to make the nearby Rhine Valley so famous. Visit the colorful Basilica of St. Kastor and ride the ferry and the chairlift to Festung Ehrenbreitstein, a gigantic fortress on the heights across the Rhine. In the Moselle valley, not far from Koblenz, is one of Germany's most beautiful intact castles—Burg Eltz, an authentic medieval castle begun in the 12th century by the Eltz family, which still owns the castle. The interior is also authentic, from the toys in the children's room to the massive tree stump used as a chopping block in the kitchen. Castle Eltz is best reached by car, though for the more adventurous, an option is the train from Koblenz to Moselkern and a 35-minute hike to the castle. Koblenz is a good place to begin boat trips: You can go up the Moselle as far as Cochem, down the Rhine as far as Cologne or up the Rhine as far as Mainz. The KD German Line runs a full schedule May-September and a reduced schedule in April and October.